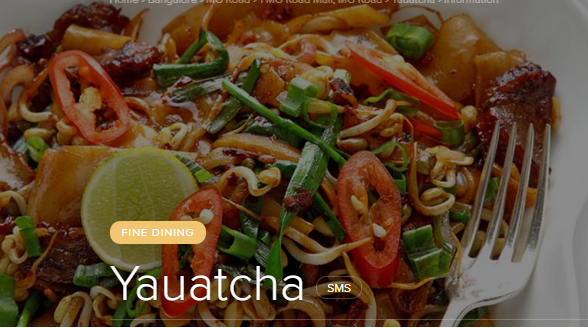 When I called them, the automated voice of a lady asked me to dial 1 if I wanted Yauatcha London, 2 if I wanted Yauatcha Bangalore, and 3 for Yauatcha Delhi. I was stumped at London so I had to redial to get to Bangalore. Eventually when I made the reservation and got there, I had the wrong place. You don’t want to go to Lido, where there is a life size poster of Yauatcha with their sticky rice, and their various colourful sauces in little black ceramic bowls because Yauatcha isn’t there. It is 2 buildings away on the fifth floor in One MG Road Mall, sharing luxurious space with a couple of other restaurants. Upon entering, I was delighted to find a busy and steaming open kitchen on my right, and parallel lines of tables on my left. It was like being on a train, long and neatly lined. Seats were taken, sly glances were thrown across the shiny plates on other people’s tables, and Dim sums were ordered. A Pork Charsui bun and a Pork &Prawn Shui Mai. And throughout the evening I was left struggling with the words Sui mui Sui mui bubbling like soap in my head. I liked the Pork & Prawn Shui Mai. The roll looked like cotton dipped in water. It looked translucent enough for the prawn and pork inside it to become shameless teasers. I am going to borrow the cotton comparison for the rest of this piece. The Pork Charsui bun was the lightest bun I ever ate. It looked like white sponge, only better. I expected it to crumble in my hands and leave its white after colours on my fingers but it would apparently only break smoothly in my mouth. The pork inside was sweet, the sauce smooth. The Sugarcane chicken roll was probably an over-kill although I continue to wonder how sugarcane and chicken could possibly come together in the most laughable combo. It was chicken pakoda with peas and chillies wrapped delicately around a juicy sugarcane toothpick. This was serious food and absolutely un-laughable. I decided I had seen everything in the world and that now I should retire and pass quietly, rubbing hands on my tummy. But I shouldn’t hurry because the Sticky Chicken Fried Rice with egg and the Spicy Wild Prawn Curry are now coming with the modest Wrapped chicken with black pepper. I noticed with struggling demeanour how the waiter scooped the sticky rice with a Chinese soup spoon and shook it down on my plate. It’s out of deep respect for the waiter, and the people at my table that I sometimes manage to resist diving into my food the minute it leaves the ladle. Even when I do that, I am contemplating how little food there is on the table compared to how hungry I am and how tasty the food is going to be. When I am lingering on the first seven bites, I am still strongly of the opinion that there is very little food on the table. By the time I have reached the 14th morsel, I begin to devilishly look about what’s left in the bowl and how soon my stomach seems to be filling. The sticky rice was sticky. The Prawn in the curry outdid everything else I had had so far; well everything except the dim sum. There were 6 massive chunks of prawn in a mustard-yellow curry. I was more smitten with the sticky rice and wrapped chicken with black pepper so I dutifully ignored the yellow curry and carried on. The prawn had spent just enough time with its curry to not be bored by it, while having absorbed its spice; it had retained enough to spurt some in my mouth. The Wrapped chicken with black pepper was simple although it looked anything but simple when it arrived at the table, literally wrapped in an oil paper, all hugged out with the black pepper. The Raspberry Delice which was Raspberry dark chocolate mousse, hazelnut brownie, and raspberry ice cream was a little sour for my palate after it had been massaged by the pork and prawn predecessors. I had anticipated the bill to puncture the table and it did, albeit a little too loudly. But I left with my faint heart full of promises to return and my belly aching with fullness.